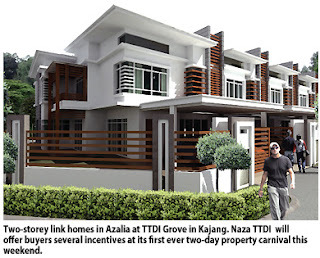 SHAH ALAM: Naza TTDI Sdn Bhd, the property development arm of Naza Group of companies, expects to sell RM315 million worth of properties at its first ever property carnival this weekend. The developer of the RM15 billion KL Metropolis project in Kuala Lumpur will offer buyers several incentives for some of its signature developments in the Klang Valley. The incentives include attractive rebates and low down payments, in addition to fast loan approval. Some of the prized properties that will be on offer during the carnival include residential units at TTDI Alam Impian in Shah Alam, TTDI Grove in Kajang and The Valley in Ampang. For TTDI Alam Impian, Naza TTDI is offering two- and three-storey linked residences in Zircona, linked and super-linked residences in Aquina and linked residences in Sephira. At TTDI Grove, units available include two-storey link homes in Dhania, Ellenia and Azalia. The Valley will introduce three-storey linked homes and exclusive villas. There will also be commercial units for its projects like TTDI Adina in Shah Alam, the second phase of the TTDI Dualis Business Centre in Equine Park, Seri Kembangan, and TTDI Grove Square 1. Combined, 276 residential and commercial units will be available for sale during the two-day carnival. The property carnival will be held from March 24 to March 25 at the TTDI Adina Sales Gallery in Section 13, Shah Alam.